Sgt. 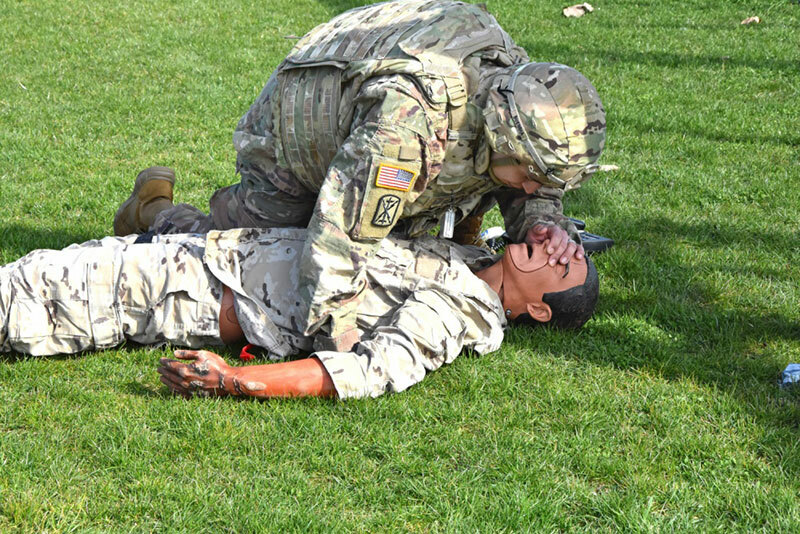 Roy Buendia, Headquarters and Headquarters Company, 2nd Squadron, 2nd Cavalry Regiment, Vilseck, Germany, participates in a first aid scenario as part of U.S. Army Europe’s 2019 Paralegal Warrior Competition March 28 at Clay Kaserne. Buendia was the winner for the sergeant to staff sergeant category. Photo By Emily Jennings. WIESBADEN, Germany – A junior enlisted paralegal specialist from Vicenza and non-commissioned officer paralegal from Vilseck took the top honors in U.S. Army Europe’s 2019 Paralegal Warrior Competition March 27-29 at Clay Kaserne. Spc. Laura Nyanankpe, Headquarters and Headquarters Company, Brigade Support Battalion, 173rd Airborne Combat Team, Vicenza, Italy; and Sgt. Roy Buendia, HHC, 2nd Squadron, 2nd Cavalry Regiment, Vilseck, Germany, were named the winners. Ten soldiers and NCOs from USAREUR, 66th Military Intelligence Brigade, 21st Theater Sustainment Command, 7th Army Training Command and U.S. Army Africa took part in the competition. They competed in two categories: corporal and below, and sergeant to staff sergeant. The Soldiers were singled out from a pool of more than 100 paralegals through quarterly boards and yearly boards to compete at the USAREUR level, said Caldwell, chief paralegal NCO with Headquarters and Headquarters Battalion, USAREUR. Soldiers earned points doing activities such as an Army Physical Fitness Test, ruck march, paralegal exam, Military Justice Online utilization, an oral examination board and warrior tasks. During the warrior tasks the Soldiers demonstrated first aid, broke down and reassembled an M4 carbine, identified plotted points on a map and completed a vehicle checkpoint scenario. After the physical challenges, the Soldiers took a written exam and were tested on their proficiency in the use of MJO. The final morning of the competition, Soldiers went before an oral board. “We all pushed each other beyond our limits, and we really made each other better,” he said.